Halloween IV: The Return of Michael Myers a.k.a Halloween 4. 1988. Directed by Dwight H. Little. Screenplay by Alan B. McElroy from a story by McElroy, Dhani Lipsius, Larry Rattner and Benjamin Ruffer. Starring Donald Pleasence, Ellie Cornell, Danielle Harris, George P. Wilbur, Michael Pataki, Beau Starr, Kathleen Kinmont, Sasha Jenson, Gene Ross, Carmen Filpi and Raymond O’Connor. Trancas International Films. Rated 14A. 88 minutes. After the good yet unfortunately improperly marketed Halloween III: Season of the Witch, the powers that be brought the series back around to another Michael Myers-centric entry in this solid slasher franchise. While I see a bit of love out there for this one, Halloween IV: The Return of Michael Myers is often unfairly lumped in with so many poor horror sequels in the various big franchises. It isn’t the best one, though, it is a long ways from being bad or the worst in the series. For me personally, I love Halloween IV and Halloween V as two well connected entries in this whole run. Yes, there are spots where you might find yourself rolling your eyes. But honestly, especially compared to some of the terrible films in Friday the 13th‘s series and Nightmare on Elm Street, this movie is lots of fun. Plus there are great, genuine scenes of terror and the ending will very likely have you totally amazed regardless of whether or not you liked the rest. Atop everything else, it’s the savagery of the slasher aspect which really impresses me about Halloween IV: The Return of Michael Myers. Ten years after the events of Halloween, Michael Myers (George P. Wilbur) wakes out of his supposed invalid state. Killing his way back to Haddonfield, he searches out his niece Jamie (Danielle Harris); daughter of his sister Laurie Strode. Under the care of a foster family, specifically her step-sister Rachel (Ellie Cornell), Jamie tries to lead a normal life. But when everyone around them starts dying her own life is in more and more danger. 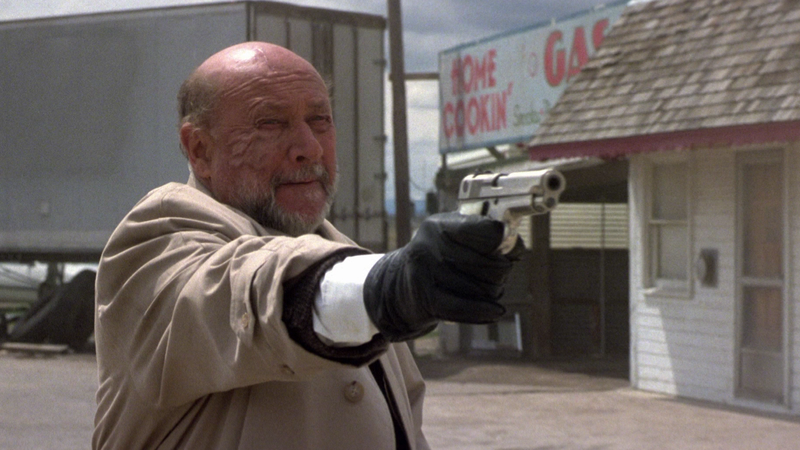 Naturally, Dr. Samuel Loomis (Donald Pleasence) – with scars of his own having survived through Michael’s violence twice (burned in Halloween II) – rushes back to the town where it all began, fast as he can. The only trouble is Myers has been supposedly killed before, he’s been incarcerated, and every time he manages to come back; each time worse, more vicious than the last. Can young Jamie and her step-sister Rachel survive his wrath? 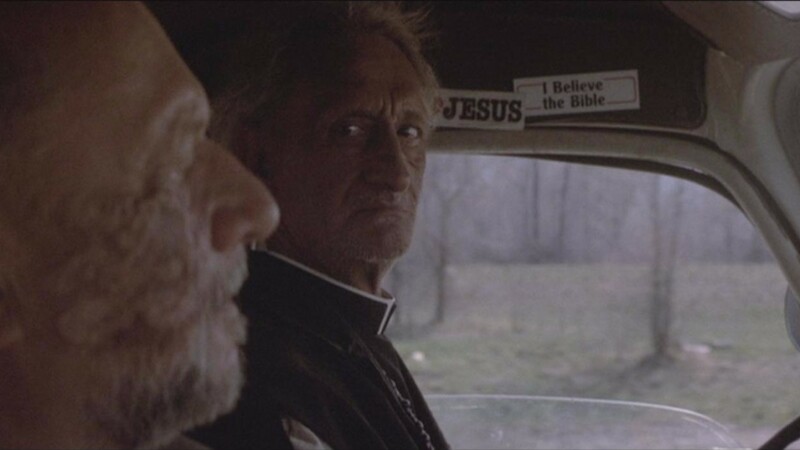 Is it possible Loomis can stop him? Is it even possible to stop him at all? There are plenty of supernatural implications in this third sequel, some blatant, others a touch more subtle. My favourite part in regards to the supernatural stuff has to do with an even more incredible strength in Michael Myers. Even in the first film, Carpenter showed how utterly brutish Michael was having him lift a teenage dude off the ground easily, pinning him to the wall, killing him. Then in the second Michael lifts another victim up with a single hand. Now in this fourth installment, there’s a strength we’ve not yet seen. Monstrously, Michael – while escaping early on – jams his thumb into the forehead of an EMT in the ambulance, puncturing the skin and bone; it’s impressively nasty and goes to show, so immediately, how strong Myers is or has become. The dynamic in this film concerning Laurie Strode’s daughter, Jamie, and Michael is pretty interesting stuff, which is a big part of why I’ve always found this movie lots of fun. What I enjoy is how their plot sort of goes to compound how deranged and relentlessly driven to murder Michael is as an evil entity. I mean, it’s not enough he tried to kill his sister, now he wants the niece to die. It’s as if Michael wants to try and wipe his entire family off the face of the earth, anyone sharing the same DNA. 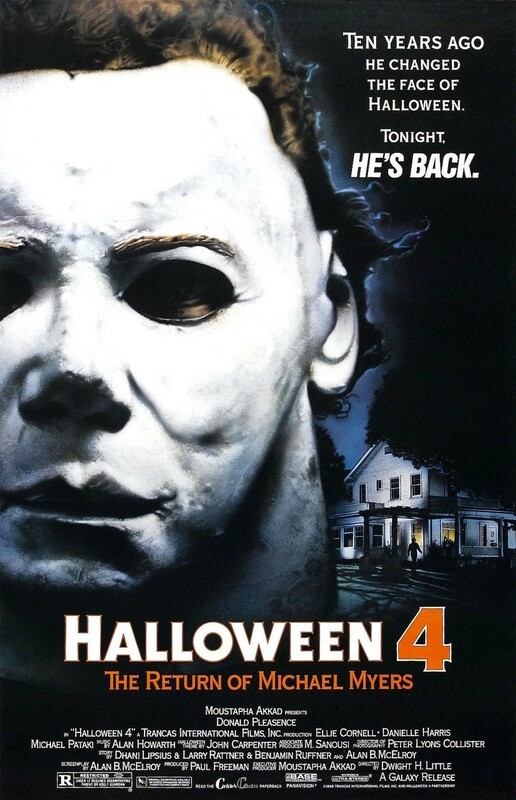 And so I feel like Halloween IV is a huge return to form for Myers, a further meaning for the title itself. Furthermore, there’s another good angle with Michael and Jamie. The poor little girl has to deal with the fact the Haddonfield boogeyman is her uncle. She’s having visions of a young Michael, the masked older Michael, and it’s terrifying to watch a young girl like her go through such an intensely awful ordeal. If it wasn’t all bad enough beforehand, Jamie’s whole existence is thrown into disorder once Uncle Michael starts slashing and killing his way further and further towards her. Being so young at the time it’s amazing how well Danielle Harris acted the part of Jamie, there’s truly no one else who could have done the job she did. So many child performers are either the same, or in the end rather dull. Harris has never been dull it seems. She had the charm of a little sweetheart and at the same time there’s a maturity about the character, something you wouldn’t normally expect from a tiny actor. Real great stuff and helps to add a bit of legitimacy to this sequel. There are lots of great little touches in Halloween IV. Like the fact Jamie ends up wearing the same Halloween costume as little Michael wore when he first killed, back at the beginning of the original film. Then there are so many similar style shots where Michael lurks at the periphery of the frame, there yet somehow not there, hiding behind the vision of everyone seemingly. Even more so than the first sequel to the original, this one has lots more slasher style horror. There are more violent scenes here than the first two films; it’s right on part with the third movie, even if that one is not a true-blooded Halloween film and more like a spin-off. So there are lots of ways in which Halloween IV: The Return of Michael Myers follows suit with the first two in this franchise, then there are elements which feel part of the story’s universe and still fresh to it, too. I’m willing to give this sequel a 4 out of 5 star rating. It’s definitely not as good as Halloween or Halloween II, but it’s solid. There is great slasher horror here, as well as excellent suspense and tension in several scenes. Out of the series, I would probably rank my favourites in this order: I, II, IV/V, III, VI, & the others get worse. This one is up there tied for third place, I have to give the movie its due. Haven’t seen it yet? Check it out soon. You’ll have a bit of fun returning to the Michael Myers plot missing from the previous installment. The Blu ray is phenomenal, from the sound/score to the visuals all around. A classic for October and nearing Halloween season.